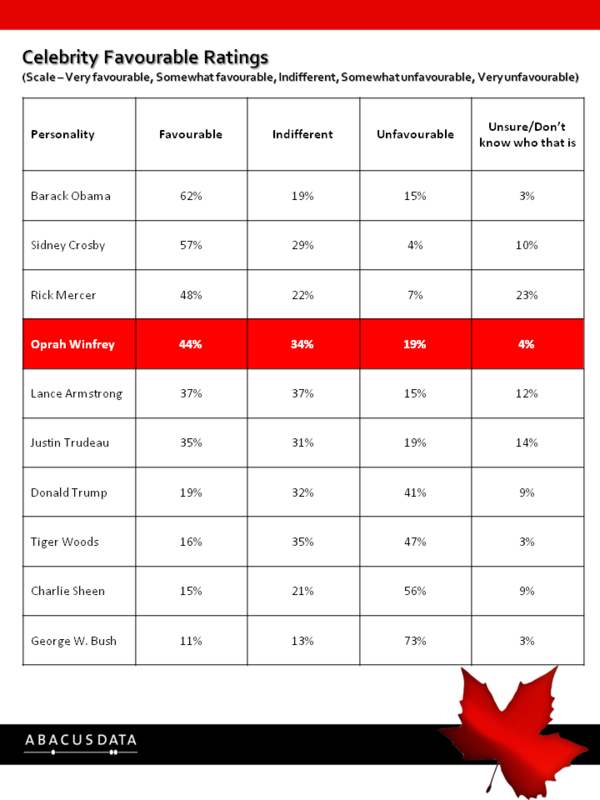 At the start of the 2011 Canadian federal election, Abacus Data polled Canadians and asked them how they felt about a number of celebrities, including the federal party leaders at the time. With The Oprah Winfrey Show ending tomorrow, I thought some of you may be interested to see how Oprah compares to some other well known celebrities. Interestingly, while she has very strong favourable ratings (Stephen Harper and Michael Ignatieff would give anything for her numbers), many Canadians are indifferent towards her. Note, this survey was done at the end of March so things could have changed since then – especially Lance Armstrong’s rating and the recent allegations about doping (don’t get me started). She is favoured more than Lance Armstrong, Justin Trudeau, Tiger Woods, and George W. Bush but trails Sidney Crosby and Barack Obama by double digits. Even Rick Mercer has a higher favourable rating than Oprah and 23% said they didn’t even know who he was. I find it interesting that 19% of Canadians said they had an unfavourable impression of her. While there are certainly differences among men and women (55% of women have a favourable impression compared with 32% for men), her appeal to Canadians is not universal. Nonetheless, Oprah is a star and a powerhouse in show business (#2 behind Lady Gaga and ahead of #3 Justin Bieber which by the way shows the power of millennials) She leaves the stage of her show with a strong following and a favourable rating that any politician in Canada would kill for.